Family & General Dentistry Serving Troy; East Greenbush & Albany, NY | J. Craig Alexander, D.M.D. From their East Greenbush Dental Office, J. Craig Alexander DMD offers family dental procedures & cosmetic dentistry, outfitted to have all of your dental needs met in one location. The approach is designed to make visits convenient and allow the greatest opportunity of finding problems and remedying them early on. For cost-effective treatment, J. Craig Alexander DMD is the name you can trust. Bringing their comprehensive general & cosmetic dentistry services and diagnosis procedures to East Greenbush, Troy, & Albany, NY allows J. Craig Alexander to offer the highest level of services to families in the Capital District. Solid dental support is something that every member of the family can benefit from. While good practice at home with a healthy diet, brushing and flossing are essential; a professional with the talent that J. Craig Alexander DMD offers is essential to keeping a beautiful, healthy smile. Give us a call and ask about our cosmetic dentistry services today. What Does Family Dentistry at Our East Greenbush Office Involve? A visual exam conducted by the experienced eye of a professional will spot signs of tooth & gum disease, misalignment, decay and a range of other abnormalities. J. Craig Alexander also offers TMJ, oral cancer screening and X-Ray for a complete diagnosis. A thorough tooth cleaning to remove plaque and tartar buildup reduces the chance of major gum disease and tooth decay problems. Conducted by a professional, a cleaning should be regularly undertaken every 6 months as an ideal form of preventative treatment. In the moderate and earliest stages of gingivitis and periodontists, an appointment with a talented family dental service can help to fight off the tartar and protect the gums. Also offering root planning, a procedure that smooths the tooth roots in an effort to prevent increased bacteria and buildup. Designed to fight tooth decay in children and adults alike, fluoride is applied topically to the teeth during an examination. Also, sealant is brushed into chewing surfaces on the molars, where the tiny cracks and dips in the enamel cannot be cleaned by a toothbrush. Sealant lasts a very long time and can prove to be invaluable as a preventative dental health procedure. A root canal is designed to stem spreading bacterial infection and remedy infected tooth pulp. Tooth pulp infections are painful, and the only way to fight them is through a root canal or pulpotomy that removes the infected pulp and restores the tooth with a crown or filling. A tooth extraction (removing a damaged adult tooth or wisdom teeth) is a procedure that has become routine, if performed by a professional family dentist. J. Craig Alexander DMD is trained and prepared to offer superior tooth extraction practices for all ages of patients. Fillings are essential and restorative procedures which repair tooth decay or damage using a metal amalgam or composite filling. The return is structural integrity and full use of the tooth. You can also use a gold or ceramic crown for capping off the tooth in question. Fillings are available for patients of all ages and there are options for crowns at all ages as well, depending on material. Intended for adult patients who have a buildup of excessive staining and discoloration on their teeth, tooth whitening can remove the aesthetic effects of smoking, beverage consumption and other lifestyle habits from teeth. The Velscope oral cancer screening test is simple and painless. Using specialized lights and filters, a dentist and view your teeth and discern abnormalities in the oral tissue of your mouth. Early detection is essential, don’t hesitate to schedule your appointment and protect your long-term health. One of the best reasons to select a specialized family dentist for your teeth examinations and cleanings is that you will enjoy convenience that other offices cannot offer. 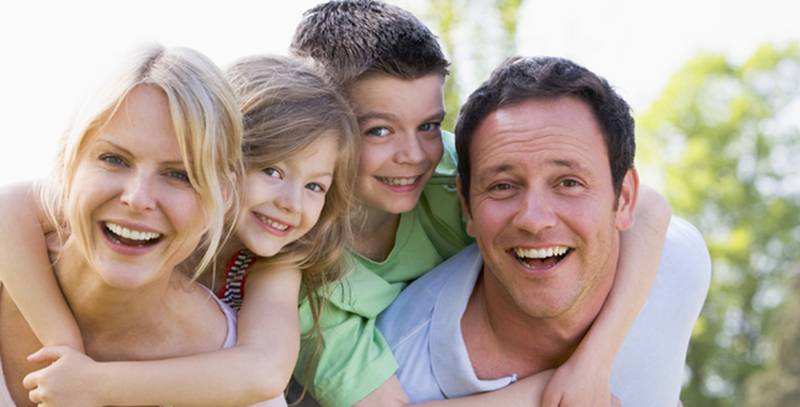 A family dentist allows you to pay and deal with insurance claims in one location. You can even plan all of your family’s appointments for one day, allowing you to get all of your routine cleanings and examinations done in a single trip. Also, the long-term service provided by a family dentist means that you will develop a relationship and a rapport with your dentist as well as the office assistants. You family’s oral health can be tracked diligently and there will never be surprises in terms of insurance and payment. Also, consolidating all of your family’s dental records in one place will mean a better continuity of care in the short and long term. For overall oral health benefit and accurate records, a family dentist will provide you with everything you need to protect your family’s oral health! Contact the offices of J. Craig Alexander DMD for scheduling and pricing information and schedule your first round of examinations and tooth cleanings today! Your family dentist is also a great point of contact in coordinating care if you or your kids need to see a specialist for more complex procedures. Ask about our cosmetic dentistry services today! Proudly serving East Greenbush & the Albany area.